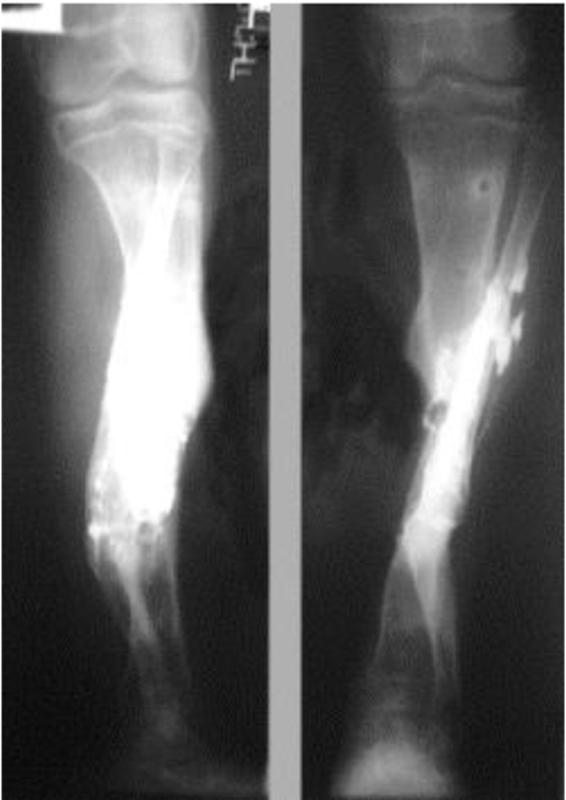 Chronic osteomyelitis is a catastrophic sequel of delayed diagnosis of acute osteomyelitis. The objectives of the study were to determine bacterial flora and antibiotic sensitivity, and to evaluate the outcome of an aggressive surgical approach to chronic osteomyelitis. This is a single surgeon, prospective cohort study on 30 consecutive patients with clinically and radiologically diagnosed chronic osteomyelitis presented to a hospital. We prospectively recorded demographic, clinical, radiological features, treatment protocol, microbiologic results of culture and sensitivity. The main treatment outcome measures were clinical signs of eradication of infection. Microbiologic results showed that Gram-negative and mixed flora accounts for more than half of chronic osteomyelitis cases while Staphylococcus aureus was a dominating single pathogen (39%). We detected a high resistance rate to common antibiotics, e.g. 83% of S. aureus isolates were resistant to oxacillin (MRSA). The mean duration of bone infection was 4.2 years (3 months to 30 years) and the mean number of operations was 1.5 (1-5) . The mean follow-up was 15 months (12-18 months). Infection was eradicated in 95% (21 out of 22) treated by a single procedure and in all patients (n=8) by double procedure. Presented the high rate of MRSA strains is alarming and calls for updating of the antibiotic therapy guidelines in the country. Good results in treatment of chronic osteomyelitis can be achieved by a single-stage protocol including radical debridement combined with systemic and topical antibiotic. Keywords: Antibiotic resistance, Debridement, Septic non-union, Topical antibiotics, Chronic osteomyelitis, One-stage treatment. © 2018 Jerzy and Francis. Chronic osteomyelitis is a catastrophic sequel of delay in diagnosis and management of the acute stage of the disease. It presents complex therapeutic challenges and imposes a high cost on healthcare provision. In contrast to developed countries, in low-resource countries, chronic osteomyelitis is much more common [1Wirbel R, Hermans K. Surgical treatment of chronic osteomyelitis in children admitted from developing countries. Afr J Paediatr Surg 2014; 11(4): 297-303. [http://dx.doi.org/10.4103/0189-6725.143133] [PMID: 25323177] -6Yeargan SA III, Nakasone CK, Shaieb MD, Montgomery WP, Reinker KA. Treatment of chronic osteomyelitis in children resistant to previous therapy. J Pediatr Orthop 2004; 24(1): 109-22. [http://dx.doi.org/10.1097/01241398-200401000-00021] [PMID: 14676545] ]. Inadequate health care setting frequently combined with patient malnutrition makes chronic osteomyelitis long lasting and causing more severe disability [3Mantero E, Carbone M, Calevo MG, Boero S. Diagnosis and treatment of pediatric chronic osteomyelitis in developing countries: prospective study of 96 patients treated in Kenya. Musculoskelet Surg 2011; 95(1): 13-8. [http://dx.doi.org/10.1007/s12306-011-0104-0] [PMID: 21373913] , 7Kinik H, Karaduman M. Cierny-Mader Type III chronic osteomyelitis: the results of patients treated with debridement, irrigation, vancomycin beads and systemic antibiotics. Int Orthop 2008; 32(4): 551-8. [http://dx.doi.org/10.1007/s00264-007-0342-9] [PMID: 17375299] , 8Alonge TO, Ogunlade SO, Omololu AB, Fashina AN, Oluwatosin A. Management of chronic osteomyelitis in a developing country using ceftriaxone-PMMA beads: An initial study. Int J Clin Pract 2002; 56(3): 181-3. [PMID: 12018822] ]. Treatment of chronic osteomyelitis, apart from prolonged antibiotic therapy requires radical debridement often resulting in bone and soft tissue defect which requires complex reconstructive procedures. In a low-resource setting not all reconstructive procedures can be implemented [1Wirbel R, Hermans K. Surgical treatment of chronic osteomyelitis in children admitted from developing countries. Afr J Paediatr Surg 2014; 11(4): 297-303. [http://dx.doi.org/10.4103/0189-6725.143133] [PMID: 25323177] , 8Alonge TO, Ogunlade SO, Omololu AB, Fashina AN, Oluwatosin A. Management of chronic osteomyelitis in a developing country using ceftriaxone-PMMA beads: An initial study. Int J Clin Pract 2002; 56(3): 181-3. [PMID: 12018822] ]. Commonest pathogen responsible for chronic osteomyelitis remains Staphylococcus aureus [1Wirbel R, Hermans K. Surgical treatment of chronic osteomyelitis in children admitted from developing countries. Afr J Paediatr Surg 2014; 11(4): 297-303. [http://dx.doi.org/10.4103/0189-6725.143133] [PMID: 25323177] , 6Yeargan SA III, Nakasone CK, Shaieb MD, Montgomery WP, Reinker KA. Treatment of chronic osteomyelitis in children resistant to previous therapy. J Pediatr Orthop 2004; 24(1): 109-22. [http://dx.doi.org/10.1097/01241398-200401000-00021] [PMID: 14676545] -9Aytaç S, Schnetzke M, Swartman B, et al. Posttraumatic and postoperative osteomyelitis: Surgical revision strategy with persisting fistula. Arch Orthop Trauma Surg 2014; 134(2): 159-65. [http://dx.doi.org/10.1007/s00402-013-1907-2] [PMID: 24337627] ], while Methicillin-Resistant S. Aureus (MRSA) rates range from 10% to 59% [1Wirbel R, Hermans K. Surgical treatment of chronic osteomyelitis in children admitted from developing countries. Afr J Paediatr Surg 2014; 11(4): 297-303. [http://dx.doi.org/10.4103/0189-6725.143133] [PMID: 25323177] , 3Mantero E, Carbone M, Calevo MG, Boero S. Diagnosis and treatment of pediatric chronic osteomyelitis in developing countries: prospective study of 96 patients treated in Kenya. Musculoskelet Surg 2011; 95(1): 13-8. [http://dx.doi.org/10.1007/s12306-011-0104-0] [PMID: 21373913] , 7Kinik H, Karaduman M. Cierny-Mader Type III chronic osteomyelitis: the results of patients treated with debridement, irrigation, vancomycin beads and systemic antibiotics. Int Orthop 2008; 32(4): 551-8. [http://dx.doi.org/10.1007/s00264-007-0342-9] [PMID: 17375299] -12Motsitsi NS. Management of infected nonunion of long bones: The last decade (1996-2006). Injury 2008; 39(2): 155-60. [http://dx.doi.org/10.1016/j.injury.2007.08.032] [PMID: 18234202] ]. Gram-negative and polymicrobial infections were commonly reported [1Wirbel R, Hermans K. Surgical treatment of chronic osteomyelitis in children admitted from developing countries. Afr J Paediatr Surg 2014; 11(4): 297-303. [http://dx.doi.org/10.4103/0189-6725.143133] [PMID: 25323177] , 10Chen AF, Schreiber VM, Washington W, Rao N, Evans AR. What is the rate of methicillin-resistant Staphylococcus aureus and Gram-negative infections in open fractures? Clin Orthop Relat Res 2013; 471(10): 3135-40. [http://dx.doi.org/10.1007/s11999-013-2855-4] [PMID: 23543416] , 13Carvalho VC, Oliveira PR, Dal-Paz K, Paula AP, Félix CdaS, Lima AL. Gram-negative osteomyelitis: Clinical and microbiological profile. Braz J Infect Dis 2012; 16(1): 63-7. [http://dx.doi.org/10.1590/S1413-86702012000100011] [PMID: 22358358] ]. The primary aim of this study was to analyze bacterial flora and antibiotic sensitivity underlying chronic osteomyelitis. The secondary aim was to evaluate and compare the outcome of single- and double-stage clinical protocols for chronic osteomyelitis. A single surgeon, prospective cohort study of 30 consecutive patients with chronic osteomyelitis treated in one institution was conducted between January 2014 and May 2016. The study was approved by the university (No UREC 2-2012) and hospital research ethics committees and all patients gave informed consent to participate in the study. Patients with chronic osteomyelitis were included in the study. Chronic osteomyelitis was defined as presence for a minimum of 4 weeks clinical and radiological features of bone infections accompanied by at least one of the following: the presence of a sinus, a sequestrum, an intra-operative pus and positive microbiological cultures. Characteristic radiological features included the presence of bone destruction, sequestum and new bone formation. Informed consent was obtained from patients or guardians. Patients who had sub-clinical infection, shorter than 4-week history, refused informed consent or who withdrew their consent in the course of the study were excluded in the final analysis. Pus swab specimens were obtained deep from discharging sinuses or collected intraoperatively and placed into the Stuart Transport Medium and immediately transported to the laboratory. Care was taken to avoid the skin contamination. The specimens were Gram-stained and cultured on blood Agar Media and MacConkey Agar Media. To differentiate the organisms isolated, Gram-staining, colony characteristics were applied and the bacterial species, biochemical tests were performed. We used antibiotic-impregnated discs (Oxoid, Scoresby, Australia) to test antibiotic sensitivity of the isolates. Specimens were classified according to the Clinical and Laboratory Standards Institute Guidelines Institute [14 Institute. CaLS. Performance standards for antimicrobial susceptibility testing: Nineteenth informational supplement In: Institute CalS, editor. CLSI Document M100-S19. Wayne, Pennsylvania: Pennsylvania Clinical and laboratory Standards Institute; 2009.] as sensitive, intermediate or resistant (Table 2). We prospectively recorded on standard research forms demographic and clinical features (Table 1). The nutrition status for children was measured as percentage of desired body weight for age (normal 80-100%, underweight 60-79%, severe malnutrition as less than 60%).The Cierny-Mader anatomic (determined at operation) and host status classification was applied. Radiological and microbiological outcomes were confirmed by assessors who were not involved in the management of the patients. Demographic features of the patients with primary surgical infections admitted to tertiary hospital, PNG, 2014-2016. Patients were managed according to single- or double-stage clinical protocols for chronic osteomyelitis. The single-stage involved excision of sinuses, metal removal, radical bone debridement aiming at removing all necrotic bone down to bleeding bone (‘paprika sign’), bone marrow cavity reaming where required. We paid special attention to the removal of all the biofilm by curettage, scrubbing and irrigation of the wound with saline solution. Post debridement, all patients had topical antibiotic application (gentamycin and rifampicin) and systemic antibiotic based on the previous culture and sensitivity test. The bone defect was filled with autogenic bone graft and/or calcium sulfate. In case of soft tissue defect, an attempt was made to cover the bone with well-vascularized muscles or fascio-cutaneous local flap. For more complex cases with difficult soft tissue management requiring a local flap cover and/or significant bone defect (more than 1cm) requiring autogenous bone grafting we adopted a double-stage protocol. The first stage consists of radical debridement, removal of metal, wash out, topical antibiotics, covering stripped bone by muscle and a loose skin approximation. Usually, the second stage was performed after a week and involved repeated debridement, filling of bony defect with autogenous bone graft mixed with calcium sulfate and topical antibiotics, bone stabilization and soft tissue cover. Depending on the case we selected either external fixator in the first or internal fixation applied in the second stage. Most of our patients were on antibiotics on admission. While we stopped the antibiotic administration before the procedure, the period of 2 weeks without antibiotics for culture taking could not be followed. On the day of the procedure, we applied antibiotics based on the susceptibility results and continued intravenously for a week. Then, oral antibiotic therapy consisting of two antibiotics continued routinely up to 6 weeks. The main outcome of the combined treatment was healing of the sinuses and wounds, and lack of the infection recurrence. Treatment failure was defined as signs of recurrent infection proved by positive culture, sinus formation, pathological fracture and further surgery for bone infection. Secondary outcomes were the length of hospitalization and in case of septic non-union the time to bone union. Typically, the patients were followed up in 2, 6 and 12 weeks, 6 and 12 months; minimal follow up was set as 12 months. The descriptive data analysis was performed using the computer software SPSS version 15. Numerical data were expressed as arithmetic mean with standard deviation (mean ±SD), and categorical data as percentage representation. Summary of antibiotic sensitivity tests of bacteria obtained from patients with chronic osteomyelitis in tertiary hospital, PNG, 2014-2016. Table 1 presents demographic and some clinical characteristics of the participants. In 73% of the cases of the chronic osteomyelitis was caused by inadequate treatment of open fractures. Children less than 16 years old constitute 63% of the whole group. Antibiotic treatment prior to the admission could be one of the factors contributing to a relatively low white cells count for the participants. The most common single pathogen was S. aureus (12 out of 31 positive cultures, 39%). Of 31 positive cultures Gram-negative bacteria accounted for 41% (n=13) and polymicrobial infection for 13% (n=4), and Candida sp. for 10% (n=3) (Fig. 1 ). Microbiologic results showed that Gram-negative and mixed flora accounts for more than half (54%) of chronic osteomyelitis. Bacterial profile of the patients with chronic osteomyelitis, tertiary hospital, PNG, 2014-2016. The most alarming finding was that 83% of S. aureus strains were resistant to methicillin (MRSA) (Table 1). 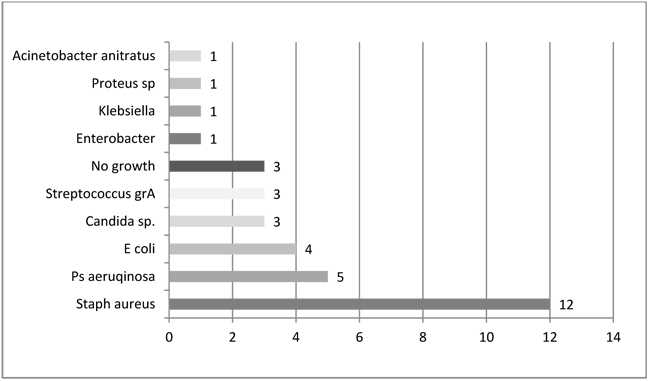 In addition, almost two-thirds of S. aureus strains (67%) were also resistant to ceftazidime. We reported a high sensitivity of S. aureus to ciprofloxacin and erythromycin (100%), gentamycin (92%) and chloramphenicol (83%). Gram-negative bacteria showed a high sensitivity to ciprofloxacin (100%), ceftazidime (92%), gentamycin (75%) and chloramphenicol (60%) but lack of sensitivity to trimethoprim-sulfamethoxazole (0%) or low sensitivity to ampicillin (8%) and tetracycline (25%). Of note was detection of Gram-negative bacteria resistant to multiple drugs, e.g. E. coli sensitive only to ceftazidime or Klebsiella pneumonie and Pseudomonas aeruquinosa sensitive only to ceftazidime and ciprofloxacin. The mean duration of bone infection was 4.2 years (3 months to 30 years) and the mean number of operations was 1.5 (1-5). The mean hospital stay was 5.3 (range, 2-36) weeks. The mean follow-up was 15 months (12-18 months). Two patients out of 30 (7%) were lost to follow up; 1 from each treatment group. We applied an intention-to-treat principle and the missing observations were replaced by the median for the particular treatment group. Infection was eradicated in 95% (21 out of 22) treated by a single-procedure and in all (8) the double-procedure group. Two local recurrences occurred within 3 months, one was treated with additional procedures and one refused further surgery. Overall, adverse events were prolonged serous wound leakage in 3 cases (10%), 2 partial soleus muscle flap necrosis that healed after the debridement and skin grafting, 3 half pin infections and 2 delayed unions. The management was tailored to patient’s characteristic. Eight children with chronic osteomyelitis of tibia (Cierny-Mader stage IVA) were treated by radical debridement in the form of the tibia de-roofing, topical and systemic antibiotics as well as covering of the debrided tibia by well vascularized muscle. There was one recurrence of infection (out of 8, 13%) in this subgroup. Four patients with chronic infection and bone union with the presence of an intramedullary implant (Cierny-Mader stage IVA) were managed by implant removal, sinuses excision, bone canal reaming, washing, topical and systemic antibiotics. There was no recurrence of infection in this subgroup. Three patients diagnosed as septic non-union with bone defect in ulna after Rusch pin stabilization were treated by a two-stage approach. The average length of bone defect was 2.3cm (1.5-3.2 cm). In the second stage, we applied tri-cortical iliac crest autologous bone graft impregnated with a topical antibiotic and DCP long plate, bone covering with muscle and suture. In all cases, eradication of infection and graft incorporation with bone union was achieved (Figs. 2 and 3 ). Case 1: A 40-year old female 5 months after Rush pin fixation, non-union of ulna and septic nonunion of radius with sequestrum, 2.2cm bone defect and sinus. Case 1: Five months after two-stage approach: radical debridement with topical and systemic antibiotics followed in a week by a tri-cortical iliac bone graft and plating. Septic non-union of humerus (n=3) were managed by one-stage protocol and a monoplane external fixator with compression. All healed with average union time of 3.9 (range 2.5 - 4.2) months without recurrence of infection. One patient sustained the radial nerve palsy which resolved. The patients with septic nonunion of tibia (n=10) required in average 2.2 (range 1-5) procedures. In cases where well vascularized soft tissue cover could be assured and bone defect less than 1 cm we performed single-stage management. When tibia defect was larger than 1cm (average gap of 3 cm; 2.2 to 7cm) we adopted a two-stage protocol. In tibia septic non-union the bone was stabilized with the cast (n=2), locked intramedullary nail (n=1), Ilizarov external fixator with compression (n=6) and locking plate (n=1). In all cases but one fibular osteotomy was performed at different level than tibia fracture and more proximally than 6 cm from the ankle. The average union time confirmed on X-ray was 6.3 (range 6-10) months. For six patients with a larger bone defect, Ilizarov frame was applied. However, only 2 united without additional procedures in 3 months. After the external fixator removal, we applied the patellar tendon bearing cast with partial weight bearing until solid callus was shown on X-ray. For the patient with 7 cm-long tibia defect (Fig. 3 ), we adopted induced membrane method (waiting time 5 weeks) then the contralateral free fibula graft was placed, stabilized with intramedullary rod and augmented by the iliac crest graft and calcium sulfate (Fig. 4 ). Because of delayed union at the proximal end at 6 months, the bone marrow with calcium sulfate was injected into the non-union site and in 9 months the union was confirmed (Fig. 5 ) and patient ambulating without pain. A 15-year-old boy 15 months post a car accident with chronic osteomyelitis and tibia defect of 7cm, inadequate soft tissue coverage (anterior tibia covered with split skin graft) and multiple sinuses. First stage included radical debridement, spacer from hydroxyapatite, topical antibiotics (rifampicin and gentamycin) and soleus flap cover, immobilization with a long slab. 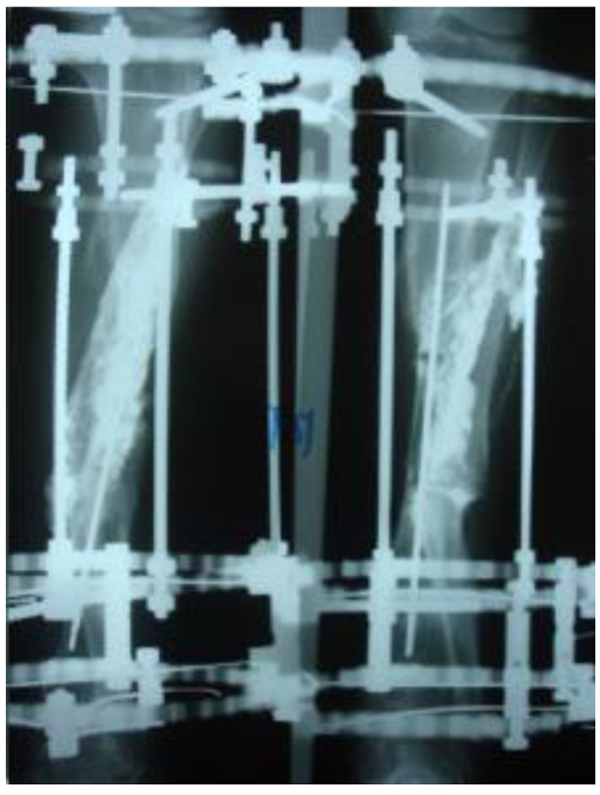 Case 2: Five months post 2nd operation comprising contralateral free fibular graft stabilized by intramedullary rod, iliac crest graft, calcium sulfate with topical antibiotics and Ilizarov fixator. Lack of callus and gap at the proximal end of the fibular graft, injected 30ml of bone marrow with calcium sulfate, applied 4mm compression in 1mm steps daily. In 6 ring fixators we had 2 pin-site infections (33%), one superficial that responded to antibiotics and one required the pin removal. In 2 cases of chronic osteomyelitis of calcaneus (Cierny Mader stage III A& IIIBC) with a soft tissue defect we applied two-stage approach achieving healing (Fig. 6 ). After 9 months from the bone grafting and Ilizarov application tibia union was achieved and patient was able to ambulate without pain, the limb was shortened 2 cm. Despite progress in understanding of chronic osteomyelitis and advances in surgical techniques, chronic osteomyelitis still possesses treatment challenges. Our findings correspond to other authors that Gram-negative and polymicrobial flora are dominating pathogens responsible for chronic osteomyelitis [1Wirbel R, Hermans K. Surgical treatment of chronic osteomyelitis in children admitted from developing countries. Afr J Paediatr Surg 2014; 11(4): 297-303. [http://dx.doi.org/10.4103/0189-6725.143133] [PMID: 25323177] , 10Chen AF, Schreiber VM, Washington W, Rao N, Evans AR. What is the rate of methicillin-resistant Staphylococcus aureus and Gram-negative infections in open fractures? Clin Orthop Relat Res 2013; 471(10): 3135-40. [http://dx.doi.org/10.1007/s11999-013-2855-4] [PMID: 23543416] , 13Carvalho VC, Oliveira PR, Dal-Paz K, Paula AP, Félix CdaS, Lima AL. Gram-negative osteomyelitis: Clinical and microbiological profile. Braz J Infect Dis 2012; 16(1): 63-7. [http://dx.doi.org/10.1590/S1413-86702012000100011] [PMID: 22358358] ] while S. aureus remains the single main pathogen responsible for osteomyelitis [1Wirbel R, Hermans K. Surgical treatment of chronic osteomyelitis in children admitted from developing countries. Afr J Paediatr Surg 2014; 11(4): 297-303. [http://dx.doi.org/10.4103/0189-6725.143133] [PMID: 25323177] , 6Yeargan SA III, Nakasone CK, Shaieb MD, Montgomery WP, Reinker KA. Treatment of chronic osteomyelitis in children resistant to previous therapy. J Pediatr Orthop 2004; 24(1): 109-22. [http://dx.doi.org/10.1097/01241398-200401000-00021] [PMID: 14676545] -8Alonge TO, Ogunlade SO, Omololu AB, Fashina AN, Oluwatosin A. Management of chronic osteomyelitis in a developing country using ceftriaxone-PMMA beads: An initial study. Int J Clin Pract 2002; 56(3): 181-3. [PMID: 12018822] , 12Motsitsi NS. Management of infected nonunion of long bones: The last decade (1996-2006). Injury 2008; 39(2): 155-60. [http://dx.doi.org/10.1016/j.injury.2007.08.032] [PMID: 18234202] ]. Alarming findings in our report was a higher rate (83%) of methicillin resistant S. aureus strains (MRSA) compared to other reports (10-59%) [1Wirbel R, Hermans K. Surgical treatment of chronic osteomyelitis in children admitted from developing countries. Afr J Paediatr Surg 2014; 11(4): 297-303. 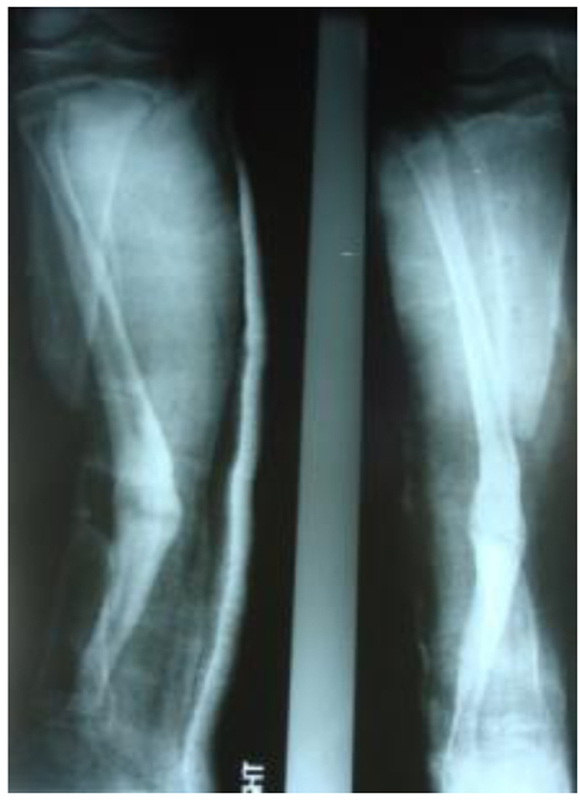 [http://dx.doi.org/10.4103/0189-6725.143133] [PMID: 25323177] , 3Mantero E, Carbone M, Calevo MG, Boero S. Diagnosis and treatment of pediatric chronic osteomyelitis in developing countries: prospective study of 96 patients treated in Kenya. Musculoskelet Surg 2011; 95(1): 13-8. [http://dx.doi.org/10.1007/s12306-011-0104-0] [PMID: 21373913] , 6Yeargan SA III, Nakasone CK, Shaieb MD, Montgomery WP, Reinker KA. Treatment of chronic osteomyelitis in children resistant to previous therapy. J Pediatr Orthop 2004; 24(1): 109-22. [http://dx.doi.org/10.1097/01241398-200401000-00021] [PMID: 14676545] -9Aytaç S, Schnetzke M, Swartman B, et al. Posttraumatic and postoperative osteomyelitis: Surgical revision strategy with persisting fistula. Arch Orthop Trauma Surg 2014; 134(2): 159-65. [http://dx.doi.org/10.1007/s00402-013-1907-2] [PMID: 24337627] ]. Common resistance to antibiotics among Gram-negative bacteria both in our series and other reports [1Wirbel R, Hermans K. Surgical treatment of chronic osteomyelitis in children admitted from developing countries. Afr J Paediatr Surg 2014; 11(4): 297-303. [http://dx.doi.org/10.4103/0189-6725.143133] [PMID: 25323177] , 10Chen AF, Schreiber VM, Washington W, Rao N, Evans AR. What is the rate of methicillin-resistant Staphylococcus aureus and Gram-negative infections in open fractures? Clin Orthop Relat Res 2013; 471(10): 3135-40. [http://dx.doi.org/10.1007/s11999-013-2855-4] [PMID: 23543416] , 13Carvalho VC, Oliveira PR, Dal-Paz K, Paula AP, Félix CdaS, Lima AL. Gram-negative osteomyelitis: Clinical and microbiological profile. Braz J Infect Dis 2012; 16(1): 63-7. [http://dx.doi.org/10.1590/S1413-86702012000100011] [PMID: 22358358] ] could be possibly explained by the fact that many of them had undergone prolonged antibiotic therapy. Also, very low metabolisms in deeper layers of the biofilm are believed to predispose to development of strains resistant to antibiotics [15Brady RA, Leid JG, Calhoun JH, Costerton JW, Shirtliff ME. Osteomyelitis and the role of biofilms in chronic infection. FEMS Immunol Med Microbiol 2008; 52(1): 13-22. [http://dx.doi.org/10.1111/j.1574-695X.2007.00357.x] [PMID: 18081847] , 16Walter G, Kemmerer M, Kappler C, Hoffmann R. Treatment algorithms for chronic osteomyelitis. Dtsch Arztebl Int 2012; 109(14): 257-64. [PMID: 22536302] ]. In our study, we achieved a long-lasting suppression of infection in 97% of cases. However, what apparently looks like an excellent infection eradication rate might worsen in time as relapses of infection in chronic osteomyelitis have been recorded many years later [17Leung AH, Hawthorn BR, Simpson AH. The effectiveness of local antibiotics in treating chronic osteomyelitis in a cohort of 50 patients with an average of 4 years follow-up. Open Orthop J 2015; 9(Suppl. 1): 372-8. [http://dx.doi.org/10.2174/1874325001509010372] [PMID: 26322143] , 18Al-Maiyah M, Hemmady MV, Shoaib A, Morgan-Jones RL. 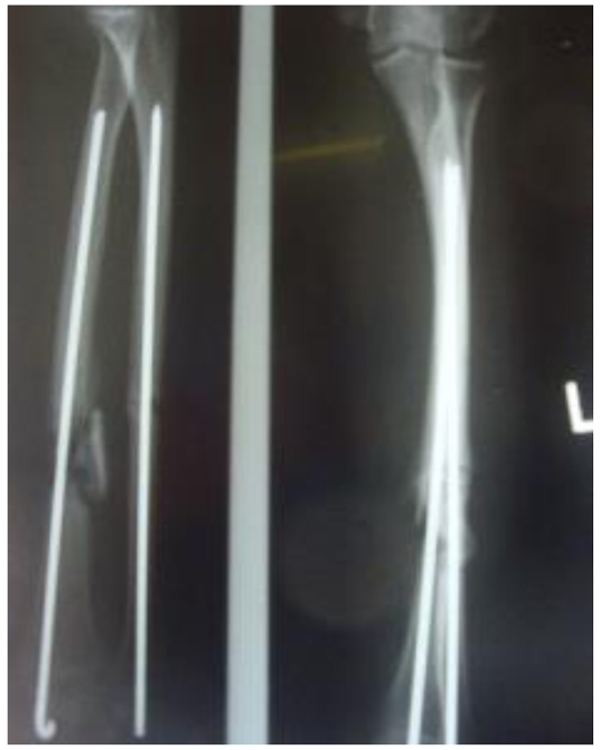 Recurrence of chronic osteomyelitis in a regenerated fibula after 65 years. Orthopedics 2007; 30(5): 403-4. [PMID: 17539217] ]. Review by Walter et al. [16Walter G, Kemmerer M, Kappler C, Hoffmann R. Treatment algorithms for chronic osteomyelitis. Dtsch Arztebl Int 2012; 109(14): 257-64. [PMID: 22536302] ] on the management of chronic osteomyelitis showed that radical debridement combined with anti-bacterial chemotherapy leads to long-lasting suppression of infection in 70% to 90% of cases. Slightly higher rates of long-lasting infection suppression (88-95%) were reported by studies which added topical antibiotics to radical debridement with and systemic antibiotics [16Walter G, Kemmerer M, Kappler C, Hoffmann R. Treatment algorithms for chronic osteomyelitis. Dtsch Arztebl Int 2012; 109(14): 257-64. [PMID: 22536302] , 19Mwangi G, Macharia JT. Use of antibioitc cement spacers/beads in treatment of musculosceletal infections at AIC Kijabe Hospital. 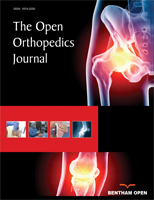 East African Orthopaedic Journal 2015; 9: 50-4., 20Ferguson JY, Dudareva M, Riley ND, Stubbs D, Atkins BL, McNally MA. The use of a biodegradable antibiotic-loaded calcium sulphate carrier containing tobramycin for the treatment of chronic osteomyelitis: A series of 195 cases. Bone Joint J 2014; 96-B(6): 829-36. [http://dx.doi.org/10.1302/0301-620X.96B6.32756] [PMID: 24891586] ]. Also, high rates of infection eradication have been reported by using various carriers for topical antibiotics such as impregnated collagen [21Knaepler H. Local application of gentamicin-containing collagen implant in the prophylaxis and treatment of surgical site infection in orthopaedic surgery. Int J Surg 2012; 10(Suppl. 1): S15-20. [http://dx.doi.org/10.1016/j.ijsu.2012.05.020] [PMID: 22659311] ], calcium sulfate [20Ferguson JY, Dudareva M, Riley ND, Stubbs D, Atkins BL, McNally MA. The use of a biodegradable antibiotic-loaded calcium sulphate carrier containing tobramycin for the treatment of chronic osteomyelitis: A series of 195 cases. Bone Joint J 2014; 96-B(6): 829-36. [http://dx.doi.org/10.1302/0301-620X.96B6.32756] [PMID: 24891586] , 22McKee MD, Wild LM, Schemitsch EH, Waddell JP. The use of an antibiotic-impregnated, osteoconductive, bioabsorbable bone substitute in the treatment of infected long bone defects: Early results of a prospective trial. J Orthop Trauma 2002; 16(9): 622-7. [http://dx.doi.org/10.1097/00005131-200210000-00002] [PMID: 12368641] -25Jia WT, Luo SH, Zhang CQ, Wang JQ. In vitro and in vivo efficacies of teicoplanin-loaded calcium sulfate for treatment of chronic methicillin-resistant Staphylococcus aureus osteomyelitis. Antimicrob Agents Chemother 2010; 54(1): 170-6. [http://dx.doi.org/10.1128/AAC.01122-09] [PMID: 19917757] ], calcium sulfate with autogenous bone graft [26Borrelli J Jr, Prickett WD, Ricci WM. Treatment of nonunions and osseous defects with bone graft and calcium sulfate. Clin Orthop Relat Res 2003; (411): 245-54. [http://dx.doi.org/10.1097/01.blo.0000069893.31220.6f] [PMID: 12782881] ]. It is suggested that relatively rapid dissolution of antibiotics from bio absorbable material avoids prolonged low-level antibiotic release as in the case of impregnated PMMA beds and is believed to reduce the risk of growing antibiotic resistance [27Anagnostakos K, Hitzler P, Pape D, Kohn D, Kelm J. Persistence of bacterial growth on antibiotic-loaded beads: Is it actually a problem? Acta Orthop 2008; 79(2): 302-7. [http://dx.doi.org/10.1080/17453670710015120] [PMID: 18484259] ]. The recurrence infection rate after PMMA carriers impregnated with antibiotics was reported to be above 10% [28Walenkamp GHKL, Kleijn LL, de Leeuw M. Osteomyelitis treated with gentamicin-PMMA beads: 100 patients followed for 1-12 years. Acta Orthop Scand 1998; 69(5): 518-22. [http://dx.doi.org/10.3109/17453679808997790] [PMID: 9855236] , 29Lazzarini L, Mader JT, Calhoun JH. Osteomyelitis in long bones. J Bone Joint Surg Am 2004; 86-A(10): 2305-18. [http://dx.doi.org/10.2106/00004623-200410000-00028] [PMID: 15466746] ] and sometimes as high as 45% [30Cho SH, Song HR, Koo KH, Jeong ST, Park YJ. Antibiotic-impregnated cement beads in the treatment of chronic osteomyelitis. Bull Hosp Jt Dis 1997; 56(3): 140-4. [PMID: 9361913] ]. Promising effects in treatment of chronic osteomyelitis both in animal models and human studies were achieved by prolonged delivery of local antibiotic through the application of novel carrier systems such as microporous hydroxyapatite [31Bhattacharya R, Kundu B, Nandi SK, Basu D. Systematic approach to treat chronic osteomyelitis through localized drug delivery system: Bench to bed side. Mater Sci Eng C 2013; 33(7): 3986-93. [http://dx.doi.org/10.1016/j.msec.2013.05.036] [PMID: 23910305] ], biodegradable composite bone cement [32Mistry S, Roy S, Maitra NJ, et al. A novel, multi-barrier, drug eluting calcium sulfate/biphasic calcium phosphate biodegradable composite bone cement for treatment of experimental MRSA osteomyelitis in rabbit model. J Control Release 2016; 239: 169-81. [http://dx.doi.org/10.1016/j.jconrel.2016.08.014] [PMID: 27582374] ] and bioactive silicate glass scaffolds [33Soundrapandian C, Mahato A, Kundu B, Datta S, Sa B, Basu D. Development and effect of different bioactive silicate glass scaffolds: In vitro evaluation for use as a bone drug delivery system. J Mech Behav Biomed Mater 2014; 40: 1-12. [http://dx.doi.org/10.1016/j.jmbbm.2014.08.007] [PMID: 25190432] ]. This type of delivery system offers longer and higher concentration of antibiotics at the infection site with diminished likelihood of toxicity [34Nandi SK, Bandyopadhyay S, Das P, et al. Understanding osteomyelitis and its treatment through local drug delivery system. Biotechnol Adv 2016; 34(8): 1305-17. [http://dx.doi.org/10.1016/j.biotechadv.2016.09.005] [PMID: 27693717] ]. We followed the conventional recommendation [1Wirbel R, Hermans K. Surgical treatment of chronic osteomyelitis in children admitted from developing countries. Afr J Paediatr Surg 2014; 11(4): 297-303. [http://dx.doi.org/10.4103/0189-6725.143133] [PMID: 25323177] , 35Howard-Jones AR, Isaacs D. Systematic review of systemic antibiotic treatment for children with chronic and sub-acute pyogenic osteomyelitis. J Paediatr Child Health 2010; 46(12): 736-41. [http://dx.doi.org/10.1111/j.1440-1754.2010.01831.x] [PMID: 20825612] ] of a minimum 1 week of parenteral and continued up to 6 weeks with oral antibiotics. Although in chronic osteomyelitis some authors postulated longer periods of antibiotic therapy [36McNally MA, Ferguson JY, Lau ACK, et al. Single-stage treatment of chronic osteomyelitis with a new absorbable, gentamicin-loaded, calcium sulphate/hydroxyapatite biocomposite: A prospective series of 100 cases. Bone Joint J 2016; 98-B(9): 1289-96. [http://dx.doi.org/10.1302/0301-620X.98B9.38057] [PMID: 27587534] ], it has been shown that post-debridement antibiotic parenteral treatment longer than one week and continuation of oral therapy beyond six weeks have not improved the outcome [37Rod-Fleury T, Dunkel N, Assal M, et al. Duration of post-surgical antibiotic therapy for adult chronic osteomyelitis: A single-centre experience. Int Orthop 2011; 35(11): 1725-31. [http://dx.doi.org/10.1007/s00264-011-1221-y] [PMID: 21318568] , 38Spellberg B, Lipsky BA. Systemic antibiotic therapy for chronic osteomyelitis in adults. Clin Infect Dis 2012; 54(3): 393-407. [http://dx.doi.org/10.1093/cid/cir842] [PMID: 22157324] ]. There is now increasing interest in a single-stage protocol which reduces hospital stay. We achieved a high infection eradication rate following a single-stage protocol. Current treatment strategy in chronic osteomyelitis recognizes single- [20Ferguson JY, Dudareva M, Riley ND, Stubbs D, Atkins BL, McNally MA. The use of a biodegradable antibiotic-loaded calcium sulphate carrier containing tobramycin for the treatment of chronic osteomyelitis: A series of 195 cases. Bone Joint J 2014; 96-B(6): 829-36. [http://dx.doi.org/10.1302/0301-620X.96B6.32756] [PMID: 24891586] , 36McNally MA, Ferguson JY, Lau ACK, et al. Single-stage treatment of chronic osteomyelitis with a new absorbable, gentamicin-loaded, calcium sulphate/hydroxyapatite biocomposite: A prospective series of 100 cases. Bone Joint J 2016; 98-B(9): 1289-96. [http://dx.doi.org/10.1302/0301-620X.98B9.38057] [PMID: 27587534] ] or double-stage clinical protocols [1Wirbel R, Hermans K. Surgical treatment of chronic osteomyelitis in children admitted from developing countries. Afr J Paediatr Surg 2014; 11(4): 297-303. [http://dx.doi.org/10.4103/0189-6725.143133] [PMID: 25323177] , 12Motsitsi NS. Management of infected nonunion of long bones: The last decade (1996-2006). Injury 2008; 39(2): 155-60. [http://dx.doi.org/10.1016/j.injury.2007.08.032] [PMID: 18234202] , 29Lazzarini L, Mader JT, Calhoun JH. Osteomyelitis in long bones. J Bone Joint Surg Am 2004; 86-A(10): 2305-18. [http://dx.doi.org/10.2106/00004623-200410000-00028] [PMID: 15466746] ]. Recent report on multiple debridement in conjunction with negative pressure wound therapy showed that increasing the number of revision procedures has not improved the rate of resolution of osteomyelitis [39Timmers MS, Graafland N, Bernards AT, Nelissen RG, van Dissel JT, Jukema GN. Negative pressure wound treatment with polyvinyl alcohol foam and polyhexanide antiseptic solution instillation in posttraumatic osteomyelitis. Wound Repair Regen 2009; 17(2): 278-86. [http://dx.doi.org/10.1111/j.1524-475X.2009.00458.x] [PMID: 19320897] ]. Similar to others [1Wirbel R, Hermans K. Surgical treatment of chronic osteomyelitis in children admitted from developing countries. Afr J Paediatr Surg 2014; 11(4): 297-303. [http://dx.doi.org/10.4103/0189-6725.143133] [PMID: 25323177] , 6Yeargan SA III, Nakasone CK, Shaieb MD, Montgomery WP, Reinker KA. Treatment of chronic osteomyelitis in children resistant to previous therapy. J Pediatr Orthop 2004; 24(1): 109-22. [http://dx.doi.org/10.1097/01241398-200401000-00021] [PMID: 14676545] , 12Motsitsi NS. Management of infected nonunion of long bones: The last decade (1996-2006). Injury 2008; 39(2): 155-60. [http://dx.doi.org/10.1016/j.injury.2007.08.032] [PMID: 18234202] , 29Lazzarini L, Mader JT, Calhoun JH. Osteomyelitis in long bones. J Bone Joint Surg Am 2004; 86-A(10): 2305-18. [http://dx.doi.org/10.2106/00004623-200410000-00028] [PMID: 15466746] , 35Howard-Jones AR, Isaacs D. Systematic review of systemic antibiotic treatment for children with chronic and sub-acute pyogenic osteomyelitis. J Paediatr Child Health 2010; 46(12): 736-41. [http://dx.doi.org/10.1111/j.1440-1754.2010.01831.x] [PMID: 20825612] ], we aimed the debridement at removing all necrotic bone down to bleeding bone (‘paprika sign’). The importance of radical debridement was demonstrated by Simpson et al. [40Simpson AH, Deakin M, Latham JM. Chronic osteomyelitis. The effect of the extent of surgical resection on infection-free survival. J Bone Joint Surg Br 2001; 83(3): 403-7. [http://dx.doi.org/10.1302/0301-620X.83B3.10727] [PMID: 11341428] ] who reported that resection margin of 5 mm had no recurrence of infection; the smaller marginal resection group had 28% of infection recurrence rate while after simple debulking all patients had recurrence within 1 year. To deal with bone defect, in our series, we utilized the following techniques: autogenous bone grafting mixed with calcium sulfate impregnated with antibiotics, free contralateral fibula graft and induced membrane technique. Although McKee et al [22McKee MD, Wild LM, Schemitsch EH, Waddell JP. The use of an antibiotic-impregnated, osteoconductive, bioabsorbable bone substitute in the treatment of infected long bone defects: Early results of a prospective trial. J Orthop Trauma 2002; 16(9): 622-7. [http://dx.doi.org/10.1097/00005131-200210000-00002] [PMID: 12368641] ], after using calcium sulfate showed healing of 14 out of 16 non-unions in chronic-osteomyelitis, however, 9 of them received also autologous iliac crest bone grafts. Likewise, Borrelli et al [26Borrelli J Jr, Prickett WD, Ricci WM. Treatment of nonunions and osseous defects with bone graft and calcium sulfate. Clin Orthop Relat Res 2003; (411): 245-54. [http://dx.doi.org/10.1097/01.blo.0000069893.31220.6f] [PMID: 12782881] ]. have shown that adding calcium sulfate with antibiotic to autogenous bone graft improved treatment results in bone defect and nonunion in chronic osteomyelitis. Calcium sulfate materials showed effectiveness in eradication of infection but it was not reliable to fill the bone defect leading to pathological fractures in 5-8% of patients [20Ferguson JY, Dudareva M, Riley ND, Stubbs D, Atkins BL, McNally MA. The use of a biodegradable antibiotic-loaded calcium sulphate carrier containing tobramycin for the treatment of chronic osteomyelitis: A series of 195 cases. Bone Joint J 2014; 96-B(6): 829-36. [http://dx.doi.org/10.1302/0301-620X.96B6.32756] [PMID: 24891586] , 41Gitelis S, Brebach GT. 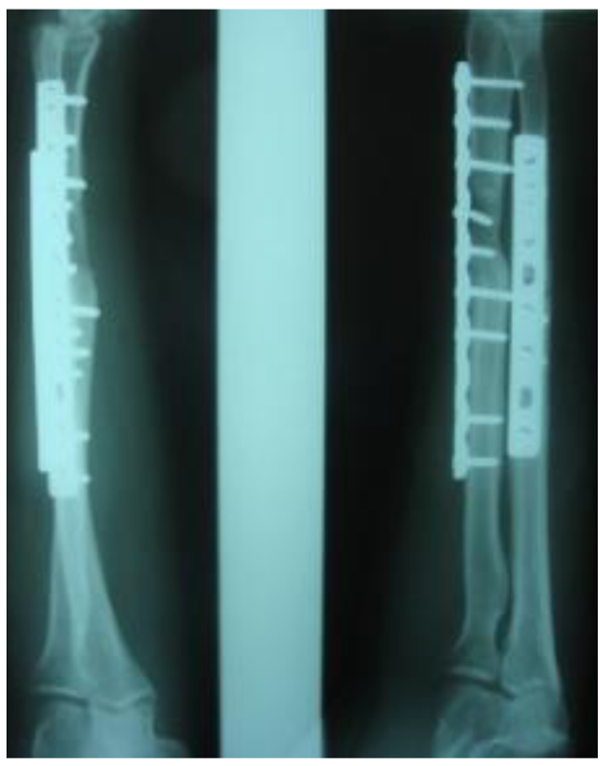 The treatment of chronic osteomyelitis with a biodegradable antibiotic-impregnated implant. J Orthop Surg (Hong Kong) 2002; 10(1): 53-60. [http://dx.doi.org/10.1177/230949900201000110] [PMID: 12401922] ]. In our study, 9 patients required different plastic-reconstructive procedures to cover the soft tissue defect. To effectively treat and prevent chronic osteomyelitis an orthopedic surgeon working in a low-resource environment should attain reconstructive plastic surgery skills. Apart from antibiotics and debridement, soft tissue coverage, and bone vascularity are important for long-lasting remission [1Wirbel R, Hermans K. Surgical treatment of chronic osteomyelitis in children admitted from developing countries. Afr J Paediatr Surg 2014; 11(4): 297-303. [http://dx.doi.org/10.4103/0189-6725.143133] [PMID: 25323177] , 42Mader JTCM, Cripps MW, Calhoun JH. Adult posttraumatic osteomyelitis of the tibia. Clin Orthop Relat Res 1999; (360): 14-21. [http://dx.doi.org/10.1097/00003086-199903000-00004] [PMID: 10101306] ]. This study has several limitations. Firstly, due to a relatively small sample size, heterogeneity of cases and single hospital location, generalization of the results should be made with caution. Secondly, blood cultures may have strengthened our findings, but were not feasible and prior administration of antibiotics would have provided a low return. Further, not all specimens were taken as intraoperative biopsy; some were taken from sinuses discharge. It is argued that specimen taken from the sinuses could be contaminated by extraneous organisms from the superficial part [43Nwadiaro HC, Ugwu BT, Legbo JN. Chronic osteomyelitis in patients with sickle cell disease. East Afr Med J 2000; 77(1): 23-6. [PMID: 10944834] ]. Thirdly, this study is limited by the relatively short follow up (minimum 12 months), however, most recurrences present within one year of treatment [20Ferguson JY, Dudareva M, Riley ND, Stubbs D, Atkins BL, McNally MA. The use of a biodegradable antibiotic-loaded calcium sulphate carrier containing tobramycin for the treatment of chronic osteomyelitis: A series of 195 cases. Bone Joint J 2014; 96-B(6): 829-36. [http://dx.doi.org/10.1302/0301-620X.96B6.32756] [PMID: 24891586] ]. Longer follow up could change a high infection eradication rate because of known cases of infection recurrence after more than one year [6Yeargan SA III, Nakasone CK, Shaieb MD, Montgomery WP, Reinker KA. Treatment of chronic osteomyelitis in children resistant to previous therapy. J Pediatr Orthop 2004; 24(1): 109-22. [http://dx.doi.org/10.1097/01241398-200401000-00021] [PMID: 14676545] , 13Carvalho VC, Oliveira PR, Dal-Paz K, Paula AP, Félix CdaS, Lima AL. Gram-negative osteomyelitis: Clinical and microbiological profile. Braz J Infect Dis 2012; 16(1): 63-7. [http://dx.doi.org/10.1590/S1413-86702012000100011] [PMID: 22358358] , 20Ferguson JY, Dudareva M, Riley ND, Stubbs D, Atkins BL, McNally MA. The use of a biodegradable antibiotic-loaded calcium sulphate carrier containing tobramycin for the treatment of chronic osteomyelitis: A series of 195 cases. Bone Joint J 2014; 96-B(6): 829-36. [http://dx.doi.org/10.1302/0301-620X.96B6.32756] [PMID: 24891586] , 29Lazzarini L, Mader JT, Calhoun JH. Osteomyelitis in long bones. J Bone Joint Surg Am 2004; 86-A(10): 2305-18. [http://dx.doi.org/10.2106/00004623-200410000-00028] [PMID: 15466746] ]. The presented antibiotic resistance pattern in chronic osteomyelitis with the very high rate of MRSA strains is alarming and calls for updating of the antibiotic therapy guidelines in the country. Although treatment of chronic osteomyelitis is challenging, good results can be achieved by a single-stage protocol including radical debridement in conjunction with systemic and topical antibiotic. The knowledge of different reconstructive techniques is necessary to reconstruct osseous and/or soft tissue defects. The study was approved by the university and institution research ethics committees: the Divine Word University Research Ethics Committee, No. UREC 2-2012; and Modilon General Hospital Research Ethics Committee, No. MGHREC 03/13. No animal were used in the research, All procedures performed involving human participants were in accordance with the Helsinki Declaration of 1975, as revised in 2008. (https://www.wma.net/en/20activities/10ethics/10helsinki/). All patients gave informed consent to participate in the study. Furthermore, I confirm that there was no any conflict of interest at the conduction of this study. The funding for the study was obtained from the Research Grants at the Divine Word University and Modilon General Hospital. Both authors contributed to the design, performance, analysis of data and manuscript preparation. A word of appreciation towards Joseph Pawying and Martina V. Hombhanje who contributed to the microbiological analysis of the samples. We also acknowledge Michelle Masin and Schola Ekari for assistance in data and microbiological samples collection. Institute. CaLS. Performance standards for antimicrobial susceptibility testing: Nineteenth informational supplement In: Institute CalS, editor. CLSI Document M100-S19. Wayne, Pennsylvania: Pennsylvania Clinical and laboratory Standards Institute; 2009. Mwangi G, Macharia JT. Use of antibioitc cement spacers/beads in treatment of musculosceletal infections at AIC Kijabe Hospital. East African Orthopaedic Journal 2015; 9: 50-4.